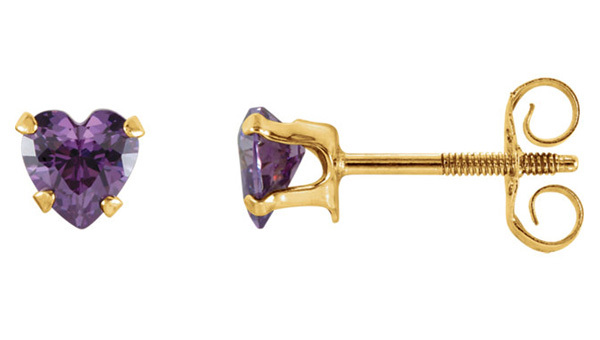 Beautiful amethyst gemstones make these amethyst heart-shaped stud earrings from Apples of Gold Jewelry pop! The earrings, which are made from 14K yellow gold, offer a heart shaped genuine amethyst stone in each, allowing you to fall in love with the combination of delicate purple and yellow gold. Each earring measures 4mm in size, and features a friction push back closure that makes getting them on securely a breeze. The stud earrings are perfect to wear for a variety of occasions. We guarantee our Amethyst Heart-Shaped Stud Earrings, 14K Yellow Gold to be high quality, authentic jewelry, as described above.